Steering toward the finish line! My Monkey Helper manuscript is now in final stages of revising and filling inside straights, for delivery to my agent next week. 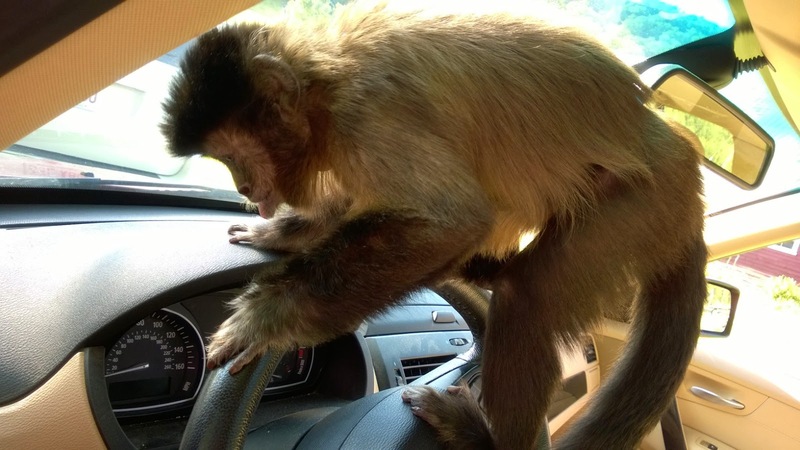 Monkey selfies are in the news these days for a few reasons. Two, we have become idiotically selfie-obsessed in general. 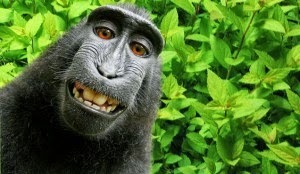 Three, monkey selfies raise intriguing questions about copyright ownership. This case has just been discussed in The New Yorker online: David J. Slater, a British wildlife photographer, set up his camera on a tripod in the hope of capturing wildlife in situ when he was visiting a nature preserve in Indonesia in 2011. The camera was taken over by a crested black macaque . The monkey liked the noise the shutter made and proceeded to take hundreds of pictures of herself. Slater has published lots of these monkey selfies and has claimed ownership/authorship. He asked that the images be removed from the Wiki commons where anyone can use them. Not so fast, says Wikimedia, the image site for Wikipedia. The New Yorker piece reports: "If Slater, as the photographer, had said that he wanted the photos taken down, Wikimedia most likely would have complied. The question that arose was whether Slater, who had not held the camera, set up the shot, or pressed the shutter, could be considered the photographer at all. Wikimedia’s position on this was clear: in the licensing conditions found at the bottom of the grinning monkey selfie, they write, “This file is in the public domain because as the work of a non-human animal, it has no human author in whom copyright is vested.” (It should be noted that Wikimedia is not saying that the monkey owns the copyright, as others have reported, but simply that Slater does not.)" Why yes, monkeys are my current fascination. I note that crested black macaques aren't very smart, especially compared to capuchins, and they wouldn't be trainable if you wanted them to learn how to take photographs on command. They are just curious.